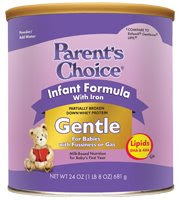 You can get a free sample of Parent’s Choice formula by heading over here and filling out the form. By doing so, you will also opt in to receive the Parent’s Choice Infant Formula News. Keep up with all of the coupons, deals and freebies by subscribing to KC Penny Pinchin’ Mama’s daily e-mail digests or RSS Reader. You can even get up to the minute updates through our Fan Page on Facebook or Tweets on Twitter. Thanks for visiting!